We offer a classically styled pedestal in six inch and eight inch diameters in Red Oak, Soft Maple and Knotty Pine (six inch diameter only). When combined with one of our four different leg styles, Ball and Claw, Empire, Lion’s Paw and Profile, you can create a variety of styles from classic country to formal elegance. Pedestals and legs are suitable for residential as well as commercial, hospitality and institutional applications. 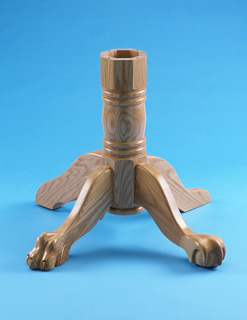 Pedestals and legs are carefully manufactured using the latest CNC technology for consistent high quality. Please note only Empire and Profile legs are available in Pine.